From the PS4 menu, go to Settings > Application Saved Data Management > Saved Data in System Storage > Delete. Look for "NBA 2K18: The Prelude, press option and delete it. Now go to Network > Connect to the Internet and uncheck it. Start NBA 2K18: The Prelude and wait until the game fully loads. Connect to the Internet again and wait until the game menu reloads. This usually takes a minute or two. Select MyCareer and you should be able to play it again. 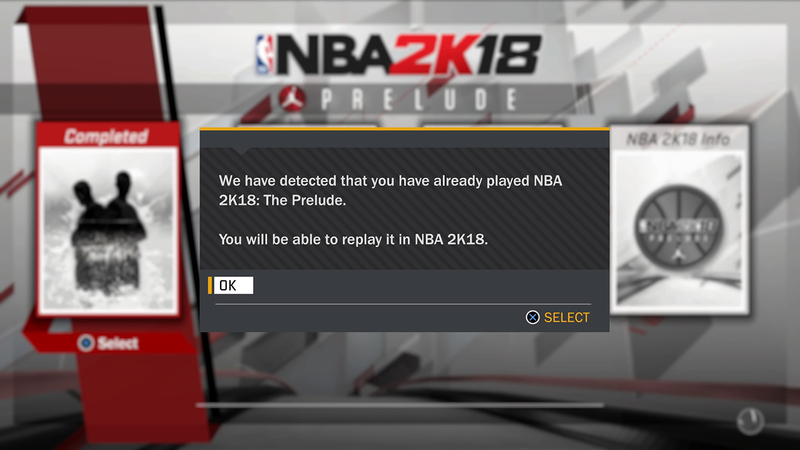 Select NBA 2K18: The Prelude from the home screen and select Manage Game. Go to Saved Data > Choose NBA 2K18 > Select Clear Reserved space and delete the save file. Open NBA 2K18 again and wait til the game reaches the menu. Go back to Settings > Connect to Xbox Live > Go Online. Wait until the "MyPlayer" option becomes available from the main menu. This may take a few minutes. Select MyCareer and you should be able to start from the beginning. Now you can create a new player in MyCareer mode and experiment between different archetypes.